Hello from San Francisco! We arrived yesterday afternoon after a two flight travel day. I'm traveling here for a business trip and Aaron's mom and Ava are with me. It's a mix of business and pleasure since they are with me and Michele is watching Ava during the work week while I'm working in our Social Media Lab office in downtown San Francisco. Michele is calling herself the "Granny Nanny" which is funny! I packed and organized two nights before our trip which took the pressure off of the night before. Our flight departed at 8am so we had to leave the house at 6am, which meant I woke at 4:30am to make sure that I had everything ready. Packing took a lot of thought because I had to take stuff for my business trip (work clothes, laptop), baby stuff (clothes, diapers, medication, my breast pump and supplies), not to mention own personal things. I had some great advice from friends who have traveled with their small children and babies. Since Ava is younger than 2 years old, she can fly for free on my lap, but I had to bring her birth certificate for documentation at check-in. Thank goodness I read that ahead of time because we wouldn't have been able to board our flight without it. Nursing at take-off, landing, and in-between: With the air pressure changes of air travel, nursing helps the baby's ears normalize. Not to mention, nursing is a baby's comfort and when they're in a strange place, their mother's breast is the safest place they know. I brought a familiar small blanket from home, which was helpful. Pashmina scarf keeps you and baby warm: I have a large wool pashmina scarf, which is perfect for wrapping up the baby while nursing or carrying her around. 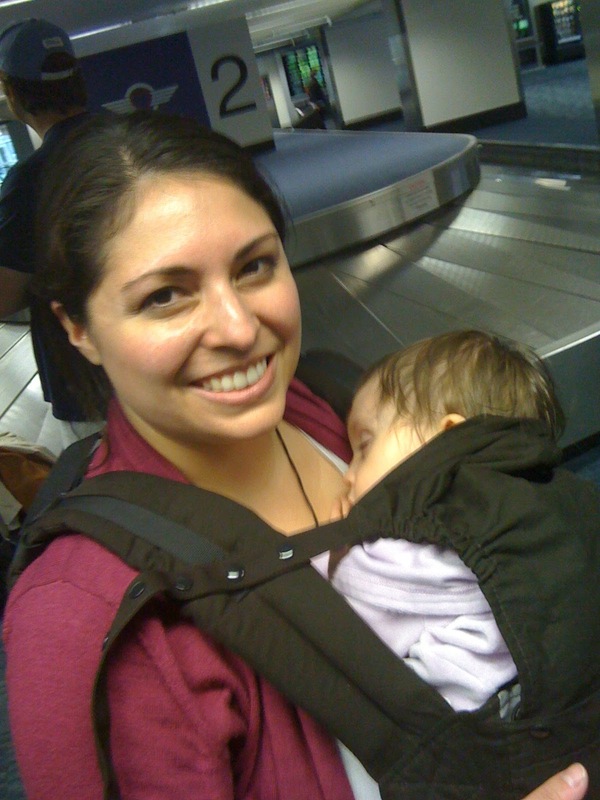 Your favorite baby carrier: I love my ring sling and used it on the plane to loosely wrap around Ava while we both slept on the plane. I didn't want to let go of her while I slept and risk her falling off my lap so I adjusted it so she was secure, but cozy. I used my soft structured carrier (in the picture) for walking on the city streets and the airport. It's very nice to have your hands free and your baby close and lower profile than a stroller. Lightweight carseat: we just got a second carseat for Aaron's car that is safe, but light. We were able to easily place it in the cab to head to the hotel and it's also fun for Ava to play in. Kids love playing with buckles! We were planning on putting it away, but she's having so much fun with it in the hotel room. 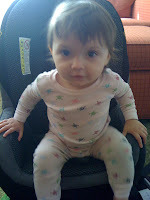 A friend lent us a backpack that holds a carseat, which was very helpful because of all the luggage we had to haul. Lots of snacks: I packed some containers with Ava's favorite non-perishable snacks like dried cranberries, puffs, yogurt melts, and pretzels. My downfall is that I wished I packed a protein snack for me to keep my energy especially being vegetarian and nursing. Smart packing: I tried to scrutinize everything that I packed to see if I really needed it. I packed enough outfits for Ava to have fresh clothes and kept a change of clothes in our carry on with extra socks just in case we lost them on the way. I packed my bottle brush, small sample sizes of dishwash soap will come in handy to wash Ava's sippy and the bottles that I pump into. Diapers for 2 days: Our family is now a cloth diapering family, but on this trip we're using disposable. Cloth diapers take a lot of physical space and time to wash the diapers. It would be fine for car trips or weekends, but 5-days on a business trip, disposable diapers are much easier. I picked up a small pack of diapers at the store when we arrived. I carried a few diapers with a small wipes container on the plane and stuffed extras in my other carry-on and more in the checked luggage. It's good to have extras in case of delays. I packed extra wipes in a resealable bag for refills. Bring baby pain reliever, diaper salve, and sunscreen: A friend brought up a good point that it's hard to find baby items (especially your favorite brands) when you're at a hotel or airport. I packed these items, which have come in handy. Buying supplies at arrival: Before our trip, I scoped out a nearby Whole Foods store. We walked to the store and stocked up on food that you don't have to heat up for breakfast and snacks such as bread, peanut butter, fruit, yogurt, and soy milk. We also grabbed plastic utensils, paper plates, and napkins for the hotel room, which have been very handy. Refrigerator in your hotel: The hotel housekeeping brought one up to our room since our room didn't have one. We are keeping Ava's milk and our food in the fridge. Our only wish is if our hotel had a microwave to reheat leftovers. Fun new toys: Aaron stopped at the dollar store and got some fun toys for Ava to play with on the plane. He got some Sesame Street flash cards, which she liked. We used the "barf bag" for Ava to put things in and take them out. At her age, this is very entertaining! Low key plans on arrival: I didn't make any plans on Saturday because I wasn't sure who we'd feel with a long day of travel. The only plan was to settle into the hotel and go to the store to buy our supplies. Adjusting to time zones: A friend suggested that I try to reset Ava's home schedule for naps, based on the time that she wakes every day. It has worked for us so far. We usually go with the flow with her natural nap schedule anyway. Today we're meeting family and friends today in the park near the Golden Gate Bridge! I'm excited because my step-mom and brother haven't meet Ava yet! And my bio-mom hasn't seen Ava since she was 5-weeks old when she came to visit us in Indy. We have some of my oldest friends coming to visit us for our bring-your-own picnic fun this afternoon. I really like the Boba! I got it just before our trip and now that we're home, I really like it for grocery stores and then I use my ring sling for home. The straps are comfortable and easy for me to put on. It reminds me of the Ergo that I tried on at the LLL Area conference at the baby wearing session. I haven't tried the BabyHawk, but I saw them on Amazon. I really like the sleeping hood!